Do You Need a New Patio Door? Is it time to get a new patio door? Doing so can not only save you money but can improve the functionality and appearance of your home. No longer will you have to deal with problems like a squeaky door or one that requires some muscle to open or close. When Should Patio Doors be Replaced? Typically, your patio doors should be replaced if you are encountering operational issues with them or if their aesthetic appeal is lacking. Common problems include struggling to open or close them and leaks which you notice during heavy rains. Furthermore, if the glass on your patio door gets foggy because of trapped moisture between the glass panels, that’s also a clear sign it’s time for a repair or replacement. Energy savings become a concern if you are able to feel a draft around the edge of the door. This will affect the ability to keep your house at the optimum temperature, and will impact the comfort level in your home. As your bills go up, the need for a new patio door becomes more and more important. Changing your patio doors can bring wonderful new changes into your home. You can finally find a solution to those fogged up doors, drafts and water leaks, eliminating inconveniences and unsightly messes. It will also improve the energy efficiency of your home, as the doors will be able to keep heat in or out as desired. A smooth and seamless opening and closing of your patio doors will make it a much more enjoyable experience to go out onto your patio. Today’s patio doors also come in a variety of new types and configurations, making the possibilities for customization seemingly endless. They are very different from the patio doors of the past, which typically only slid open and closed. The 3 basic styles you can choose from today include swinging, folding, and new and improved sliding patio doors. New sliding patio doors are the most popular as they are an excellent source of natural light and they are easy to maintain. They also don’t take up very much space because they don’t swing outwards or fold up. They are designed with large glass panels, one which is fixed in place and one that slides. Folding patio doors can be nice in an area that is large and which needs an opening. The doors work by folding like an accordion as they slide on a track positioned above the door. Swinging patio doors are like a traditional door as they open and close on hinges, however, the doors are large glass panels. You can choose from different styles such as doors which are hung in the center and hinged on either side of the center point, or doors hinged on the side so the panels meet when the doors are closed. These are also known as French doors. By upgrading an old patio door, you can transform an area in your home which you don’t like into a beautiful feature which brings additional benefits. Instead of getting frustrated with drafts coming in or sticky doors, you can enjoy a seamless operation and classy appearance. If you’d like to see the options available, you browse our collection of options on our website. Is it time to make the upgrade? Before you do, here is what you should consider. What are your options when choosing a patio door? First, you have 2 general materials to consider which are wood and fiberglass. Fiberglass can be created to look like wood, but does not involve the same level of maintenance which is a plus. It is also suited for a variety of climates. Wood is another popular option which can be a beautiful accent in a room. Alder, pine, mahogany and fir are typically used. There are different colors and grains available as well depending on the type of wood you go for. Another consideration is the level of energy efficiency, especially if you live in a climate that requires heating or cooling. Look out for glass with UV coating or e-glass. You will also need to decide between the brands available. For example, the Neuma Door system boasts 25 years of experience and offers a range of patio doors including hinged doors, gliding patio doors, and impact rated doors. 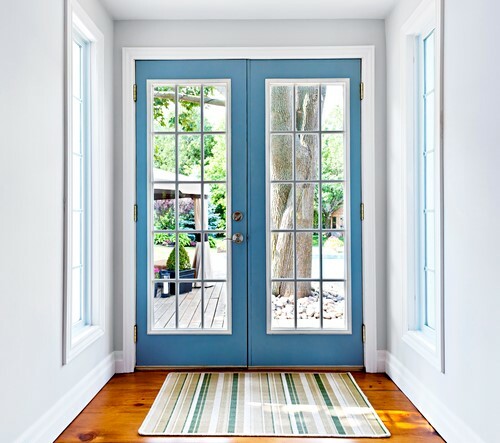 Another great brand to consider is Infinity Fiberglass Entry System, which has patio doors that require low maintenance while still being elegant and beautiful. They come in either smooth white or textured wood grain, a range of sizes, and are up to six times more energy efficient than wood. Need help finding the right door for your abode? Not to worry. Our professionals at Doors of Elegance are here to help. Contact us today to see the options we have available and which will fit best in your home.